I’ve spent the past week turning pots and other assorted chores with hopes of firing another load of pots in a week or two. Pretty ambitious! 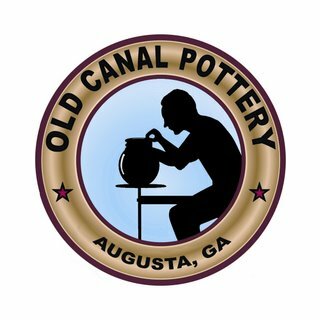 The museum at the Augusta Canal Authority will be getting many of the pots from the last firing to re-sell so I must replenish my stock. 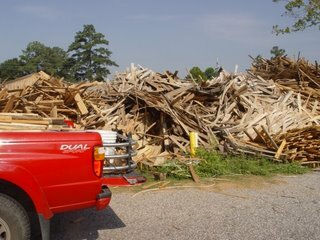 With a wood-fired kiln, the wood cutting/gathering/stacking is an ongoing chore. It never stops! Pictured here is a pallet factory waste pile. It is full of mostly thin hardwood that burns hot and fast. I use 100% scrap wood from various sources to fire the kiln. Resinous pine scrap is prefered. No matter what species, it must be dry. Wood is spot checked with a moisture meter. 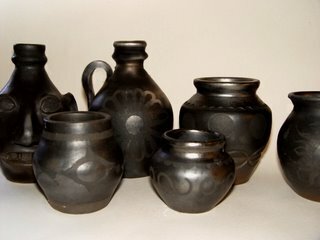 This next photo is of some Oxacan-style pots I made. I burnished them with a spoon to give them a shine, scratched designs on the surface, then fired them in a brush pile in a can of sawdust to heavily reduce or blacken them. It’s fun to play! 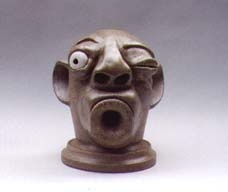 Below is a piece I like alot that is now in a private collection. I call it the Lawyer. He’s objecting politely. 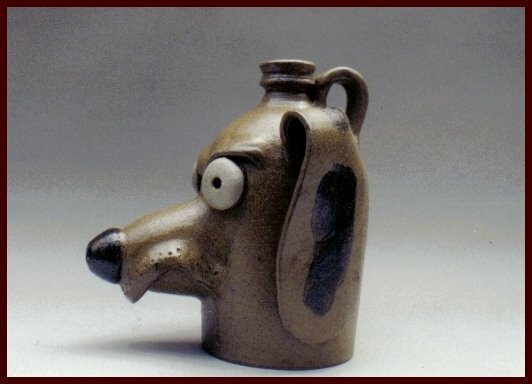 I’m the originator of the dog jug or in Georgia, “dawg” jug. These have a lot of character! They’re time-consuming to make but a favorite of mine and popular in collections. Here’s one of my chickens. They tend to vary a lot but are quite different from other folk potters. They have quite a bit of detail, including feathers. This next piece goes beyond unusual! It is based on the old slave face jugs made at some of the Old Edgefield District potteries that were located around here in the 1800’s. Yes, yes, I know, he’s creepy! 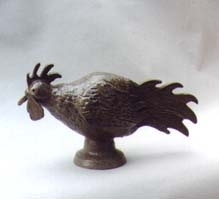 This form is actually a wigstand or wig holder and has a bonifide purpose. Unfortunately, a full head of hair doesn’t help the poor thing a bit! I thought I’d share a few unusual forms I make periodically with you and will post more as time permits. Thanks for dropping by my blog. As far as I know, you are the first potter to come by. I appreciate the encouragement, especially coming from a fellow clay hound. 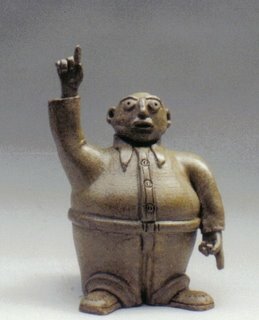 I love your work and I think your kiln should be in my back yard. Beautiful! Previous Previous post: Groundhog kiln fires first load of pottery!